I wasn't expecting much from this cosmetics line, but I have been blown away by these blushes. First of all the packaging for the Sie Bella blushes is so nice. It's that clear plastic casing, which is sleek and functional, it also allows you to see what shade is inside, and it's small and compact. It closes tightly and has protected the product from drops (of which there have been many). Also the metal pan is magnetic, so if you depot this it will go right into your metal palettes. This product is pigmented in the perfect way. It's not clown makeup, but it's visible. I only need to swipe my brush twice on the product and then twice on my cheek and the color payoff is perfection. This is what gave it it's high longevity score too, because a little goes a long way and one pan will last you for a long time, especially because it has very little fall out. The wear of the blush was great too. I did not find myself retouching it all day, it lasts throughout the day with the rest of my makeup. I am a blush fanatic, I have around 30 different blushes and I wear 3-4 a day (layering them together). 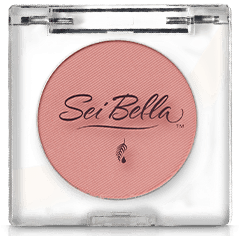 I find myself reaching for the two Sei Bella shades I have more than others because I know they stay on all day. I do wish the variety was better. They have 12 shades, which is honestly decent for blush. They have some neutrals, light pinks, deep pinks, roses and coppery orange tones. I wish they had more matte shades though (only 4 of their blushes are matte) and a few decent more purpley tones. I am linking you to a spot to purchase the blush here. I do not make any kickbacks, commissions, or sales from purchases made through this link. You can purchase these at their wholesale or become a member and get the member discount. Becoming a member requires a membership fee (like costco) but it's only $20 or $25 a year, which I get back three times just in member savings from the things I buy from them. Just for those that are curious click here for a look at Melaluca, being a member, how to do that and what that entails.